Point Pleasant junior Luke Wilson (620) hits full stride during the Gallia Academy Coach’s Corner Classic held on Sept. 5 in Centenary, Ohio. ONA, W.Va. — It wasn’t his fastest time … but Luke Wilson has never accomplished more in a race. Wilson — a junior at Point Pleasant — earned the highest finish at a state meet in school history after placing 10th overall at the 2017 Class AA-A Cross Country Championships held at the Cabell Midland High School in Cabell County. Wilson — who finished 40th last year in this same event with a time of 17:54.9 — became the first Black Knight to record a sub-17-minute time at the state final, as well as the first top-10 effort in program history. Wilson’s final mark of 16:54.87 was also the fourth of five times within two seconds of one another during a climactic race to the finish line. Wilson — who set the PPHS school record of 16:39.2 this fall at the Chick-Fil-A Invitational — posted his third fastest time of the year, a season in which the junior won varsity races at the Ripley Covered Bridge, Gallia Academy Coach’s Corner, and Wirt County Wetlands competitions. Wilson recorded his second-best time of 16:53 at the Coach’s Corner Classic in early September. PPHS coach Jessica Porter was truly excited to see Wilson reach his target of a top-10 finish at state. As she noted, it’s always nice to see effort being rewarded. Wilson is the first Black Knight to compete in multiple state meets and is joined by only Andrea Porter as repeat state qualifiers in Point Pleasant history. Junior Aaron Withrow of Winfield cruised to the Class AA-A title with a winning time of 16:09.91. Mark Ellis of East Fairmont was the runner-up in the 131-competitor field with a mark of 16:30.39. East Fairmont, with 96 points, claimed the Class AA-A team title by eight points over Fairmont Senior (104). Senior Jessica Melvin of Philip Barbour won the Class AA-A girls race with a time of 18:57.57. Winfield claimed the AA-A girls team title with 90 points, finishing two spots ahead of PBHS (92). 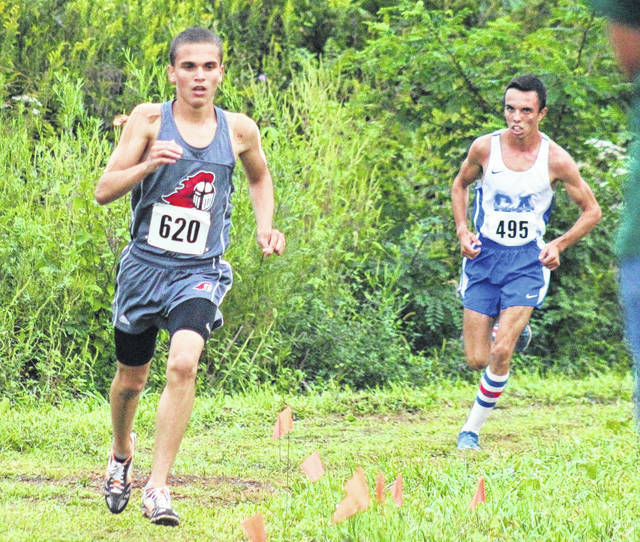 Junior Chris Barbera of Woodrow Wilson won the Class AAA boys race with a time of 15:38.54. Morgantown posted five of the top 12 finishes en route to 49 points for the AAA team championship. Sophomore Victoria Starcher of Ripley won the Class AAA girls race with a mark of 17:34.98. University won the AAA girls team title with 42 points, finishing 15 points ahead of the field. Visit runwv.com for complete results of the 2017 WVSSAC Cross Country Championships held at Cabell Midland High School.